Just like last year, we printed Kedaar's blog as a book. but finally it made it to publishing with Neeraja's determination. Kedaar will cherish the memories when he grow up. 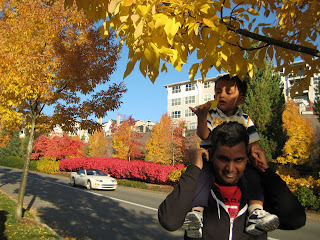 Fall colors are realy beautiful in Seattle. Most of the roads especially in our house community (Issaquah highlighands) and Microsoft are the best palces according to me to see colors. 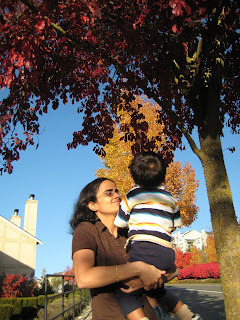 Here are the pictures we took today with Kedaar and fall colors. 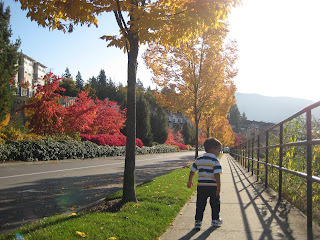 There was a celebration of Halloween in Issaquah Highlands this weekend.Kedaar didnt wear his Halloween dress, but we went just like that to check out the celebration. There were lot of activities for kids and Kedaar had a lot of fun with them. The most intresting one for him is the pony ride. He did the pony lide very nicely with smile and was not scared at all to sit on it. 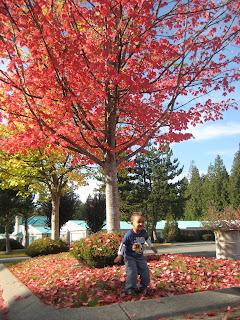 We plan to go there again tomorrow for some more time/ Here are some pictures/a video from that occassion and few other pictures we took in fall colors recently. continued to live on that experience. He says "go by bus go by bus"
Seattle in a metro bus. We got down at westlake center, looked at a small waterfall, saw the shopping mall, took monorail to go to Seattle Center. Kedaar loved the monorail and enjoyed the most while sitting it in the first seat facing skyline. 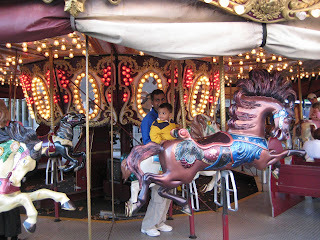 In Seattle center, there are bunch of kid amusement rides like in an exhibition in india. He looked at other kids running for the rides and started crying saying he wants to do the same. 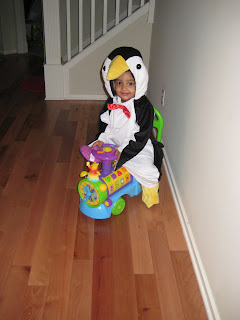 We were hesitating a little bit, but sent him on the car ride (alone) and on a merry go around with Chandra. He thoroughly enjoyed both rides giving smiles throughout and didn't show signs of fear or surprise. Kedaar completed 23 months on October 8th. He now communicates with us only through language. He has built nice little vocabulary and has a word or sentence to talk to us in every context. We have listed all the interesting sentences he spoke in last 3,4 days and the list is already too long. He can also repeat every new word we say. He now a days likes Elmo, cookie monster very much and watches sesame street videos a lot. 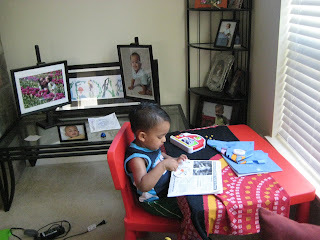 He also sits at the small desk we bought for him in Ikea and tries to scribble something every day for few mins. He says "Aa", "Aaah" (telugu alphabets) while scribbling as if he is really writing them. He can also count from 1 to 20 and can recognize 1 to 9 numbers. He is also recognizing most of the alphabets.